Trailhead and parking area are on Mt. Clinton Road in Bretton Woods, NH. Mt. Clinton Road leaves Rt. 302 8.2 miles east of Rt. 3. The parking area is on the left, less than 0.1 miles up the road. Mt. Pierce, formerly known as Mt. 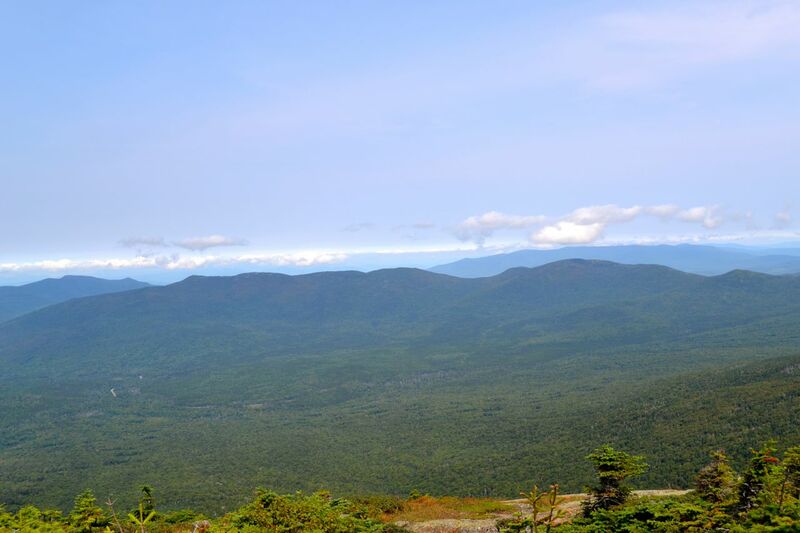 Clinton, is a peak in the Southern Presidentials which is considered one of the easiest 4000-footers to climb. From a small alpine area near its summit, there is a magnificent directional view looking up the ridge of the Southern Presidentials to Mt. Washington. It is reached via the Crawford Path, which, originally created in 1819, is the oldest maintained hiking trail in the country. From the far end of the parking area, follow Crawford Connecter into the woods and soon cross Mt. Clinton Road. The trail begins to ascend on the other side, climbing to a wooden bridge over Gibbs Brook. Pass Crawford Cliff Spur on the left just before the bridge and turn left onto Crawford Path just after it. The trail now joins the brook and climbs more steeply alongside it; in 0.2 miles, a spur leads down to Gibbs Falls, a narrow, angled waterfall. At its base is a wide and shallow pool. The trail continues to climb moderately up the mountainside over rocky terrain for a mile before the environment changes. Then, the forest around the trail becomes lush and mossy. The trail soon passes Mizpah Cutoff on the right and the grade lessens. After another mile of climbing, the trail becomes gravelly and enters the alpine zone. Trailside views begin to appear, and the trail then reaches the junction with Webster Cliff Trail. Turn right and climb 0.1 miles into the grassy alpine area. The true summit, marked by a cairn, is a short distance further on the trail. Views are spectacular. The Mt. Washington Resort is seen in the valley below to the west, next to the Rosebrook Range with its ski trails. Next over, and closer, is the Cherry-Dartmouth Range. Off in the distance are the Pliny and Pilot Ranges. In the center of the view are the rest of the Presidentials, including Jefferson and Clay, to the left of Washington, and Eisenhower, Franklin, and Monroe, in front of it. Boott Spur and the Montalban Ridge are to the right of Washington.